Kappa's fan is here!!! sakura_drop is here!!! "Tsunku-san, are you sure about this..?" "Yes, I am. This is definitely what fans would love to see." "But the girls are busy now. Their schedules are pretty hectic already..."
"Then do something about it. I won't change my mind, so find a place in their schedules for this. And hurry." C-ute's manager didn't know what to do. She had to somehow make some place for what Tsunku-san had planned.. The schedule nowadays was pretty hectic, because after Niigaki-san graduated from Morning Musume, Shimizu-san and Suzuki-san were the ones who held the leaders' titles. Niigaki-san stated, that though she leaves the leadership for Shimizu-san, she can't abandon Takahashi-san's wish, so leaves it for Suzuki-san also. So now Suzuki-san has a very hard time, trying to go between studies, dancing routines, vocal lessons, TV shows, AND the leadership. "How...how am I supposed to do this...?..." puzzled thoughts went through manager's head, as she was going to meet Berryz Koubou's manager. Here's the Prologue. It's short, but oh well..
You know,a ReinAiri fan fic was the VERY FIRST fan fiction I've ever read and it started my fandom of fanfics..
And its been a while since I read one.. I guess I'm kinda lacking the ReinAiri love over here! Interested to see where this story heads to! cant wait to read it !!! The room was not that big. It had mirrors on one of the walls, a good music system on the table. A few dance coaches and a main dance teacher were also there. The main one was talking with five girls, who were sitting on the ground. One of them had her eyes closed, head against the wall. “Airiin.” patted her lightly another girl. “Okay, everyone, you can go.” said their dance teacher. Airi murmured something, and rested her head on Maimi’s shoulder. “This is bad...” with worry said Maimi. “Well, she is tired. I’d be more tired though, if I had this many activities...” noted Saki. “I’m not sleeping, not sleeping..” murmured Airi, opened her eyes, stood up and took her belongings. “Are we going for the recording or not?” asked she with a sleepy voice and half closed eyes. “Un, we are.” answered Maimi. The first to record was Maimi. When she was recording, Airi was a bit sleepy, but tried to keep her eyes open. When the time came to record for Airi, she fully woke up, as singing gave her the power to move forward. And every time the girls heard Airi sing, they were also fired up. Her voice gave them the courage to move forward all the times, when things went wrong. “She’s too perfect...” sighed Chisa, still in a dreamy state, even though Airi ended her recording and was already sleeping while sitting on a chair, her head on Maimi’s shoulder. “Stop drooling, Nakky.” snickered Mai. “It’s in her nature. It’s Chisa we’re talking about.” smiled Maimi and patted lightly Airi’s shoulder. The girl just adjusted herself more comfortably, and slept further. “Isn’t she adorable?” asked Chisa, who just came from the recording booth. “Yes, she is.” mouthed silently the sentence the leader. “Ah, MaiMai’s turn.” but she paid attention just because she was a leader and had to take care of these girls. What she wanted to do mostly is just watch at Airi. “Yes, leader, she is.” said MaiMai about herself jokingly, when she came from the recording booth. “Un.” she mouthed ‘fighting’ without any sound and went to the recording booth. After they ended the recording, Maimi gently patted Airi’s cheek. “Un?...Ah..” she stretched herself, yawned a bit, opened her eyes fully and smiled with her usual smile, that makes everyone’s heart melt. “Sorry I slept through your singing...” she said apologetically. “Ah, it’s ok, never mind.” said the girls one after another. “Let’s go.” told Maimi and they went to have dinner at a cafe nearby. “Ah, this is sooo delicious...” squealed Chisa, Nakky and MaiMai, while eating the food. “It is.” whispered Maimi, as after eating a bit Airi again fell asleep, this time her head was resting on her hands which were on the table. Her expression was content. Well, it should be. Because she was working hard from the very early morning, now ate a delicious dinner. And here she is sleeping. Why not to be content about it..? But she’s so carefree. Maimi loved that thing about her, as she herself was an airhead, but had to put a strong and reliable image to others, while Airi was just being Airi. “Nee nee, tomorrow is the big day for the both of you, right?” asked Mai. "She really needs to rest and sleep well, if she wants to be perfect tomorrow.” said Saki. “She’s always perfect.” stated Chisa. “You’re too biased...” pouted Nakky. “You’re having a silly conversation...” murmured Airi, and then turned her head to the other side. She was half asleep now, as those woke her up. “On another note, I’m really looking forward for this cover to be released.” changed the topic Nakky. “I know, right? I remember you singing it solo, Chisa.” added Mai. “...Airi will be singing in it.” ended for her Mai and Saki. “Except I didn’t get a chorus solo. But I do not mind. As I will be in the center, hehe.” laughed lightly Saki. “Good dancers are good dancers, worth of center, still dancers.” murmured some nonsense Airi. This time she was nearly sleeping, but her subconscious still heard things, so she muttered about them and this time really fully fell asleep. “And here ends the MC Kappa’s talk.” joked Mai. “She’s tired, poor girl.” Maimi patted lightly Airi’s head and smiled. “How are we gonna get her home?” worriedly asked Chisato. “I think we’ll have to wake her again. But let’s end the eating first.” spoke Maimi and continued drinking her milkshake. The next morning Airi woke up at 5 a.m. She had a shower, put her clothes on, had breakfast, and headed to the station, from where the bus will take her. She waited about 10 minutes, then the bus came. There already was Captain and Miya. “Ohayo~.” smiled Airi after she got seated herself near the window. 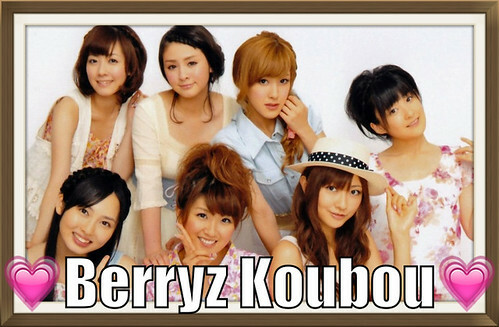 “Ohayo.” said both Berryz’ girls. “We heard yesterday you had a hard day.” said Miya in a worried tone. “I had a photo shoot for CM, then we were filming our newest TV show’s segment, then I was modeling for ‘MOUSSY’.” Miyabi’s face and eyes were shinning really bright when she was remembering the moments from the photo shoot of her modeling for her favorite brand. “I was filming at another TV show, then our newest TV show’s segment, then had a dancing competition live event.” said Saki. “You had lots of free time...” Airi sighed. “We heard you were busy...” more asked than stated Miya. “Whoaw...” both girls were surprised at how Airi can manage everything. The bus stopped, and let Reina and Maimi in. “Oha~!” nearly shouted Reina in her usual tone. “Ohayo.” smiled Maimi and wanted to sit near Airi, but Reina was first to take the seat, so Maimi seated herself near the window behind Airi. “Ohayo.” happily greeted Airi and both Berryz’ girls. “Are you ready for fun today?” asked Reina. “Un, very excited.” nodded Airi. “Just don’t fall asleep today, okay?” asked Maimi and everyone laughed. Airi at first tried to talk with others, but soon she was not interested anymore, as she remembered what happened a few months ago. "I just wonder why we five gathered here..." said Miya. "Maa, we'll find out it soon, I guess." answered Reina. "Ah, here comes the manager." Maimi turned to the woman who just came into the room. After saying the greetings, and exchanging the usual phrases the manager got serious. "I invited you five here, because of the special project Tsunku-san came up with. You five will be a part of it. I checked your schedules, and I think that somehow we can manage to pull this whole thing through. This project is a really important one. It will give the fans lots of happiness. You're going to revive... ..."
"Let's go. We're already here." said Reina. "Ah, yes, let's go." Airi smiled, picked her things and they went inside the certain building through the back entry. After they got themselves in their dressing room, Airi sat on her seat. “Oi, let’s go and change clothes.” suggested Maimi. “Yeah, we have not that much time left, and we still need to rehearse and have the make up and hairs done.” whined Miyabi. “Don’t whine. It’s not going to help.” comforted her friend Captain. They changed their clothes and went to rehearse. It was fun, and all the nervousness was already disappearing bit by bit. “Ah, thank you for working so hard with us. OtsukaReina~!” said Reina and they all bowed to the staff. “This is gonna be fun.” smiled Captain. Other girls just nodded. They couldn’t agree more. This is really going to be fun. After the rehearsal they went to eat. The eating process was very live, as they chatted about what awaits them, took lots of pictures and ate well. “You look good today, too.” stated Miyabi. “We all look good today, don’t we?” laughed Saki and with her laughed others. “Hey, I was wondering... When do you have free time?’ asked Saki others’. “I don’t have. At least these few weeks.’ pouted Airi. “E~H? Hontou ni?” Reina was in shock. This girl is really working hard, doing so many jobs, and Tsunku-san is not giving her free time?! “Ah, do not flatter me.” blushed Airi. “But it’s true. I agree with her.” nodded Maimi. “Can’t we change the topic..?” asked Airi with a smile. “Oh, I know. Let’s sing “Dance de BAKOON’ just for fun!” suggested Reina. “I’m going with Nakky’s.” smiled Saki and everyone chuckled. “Then I’m with Chisa’s.” answered Reina. They voiced the instrumental, and then started singing. “Ah, that was sooo fun!” laughed Reina. “I’m glad we’re alone here.” giggled Maimi. “Why? It would have been fun to have some audience.” nodded Captain. “We’ll have the audience today, so don’t worry, be happy.” chuckled Airi. "But we won't be able to perform this song." sighed Saki. "I think we'll be able to perform it in the future." winked Maimi to her. "I hope so." sighed again Saki. “Oh, I’m now so waiting for the real performance.” nearly squealed Miya. “Then let’s go. Not much time is left anyways.” said Reina and they left the restaurant. After they came back to the certain building, they hurried into their dressing room, so for S/mileage not to notice them. They already heard those cute girls making noise in corridors, anticipatedly running to the stage. “They will be surprised, hehe.” smiled Airi. Now they were having a make-up and hairdos done for them. 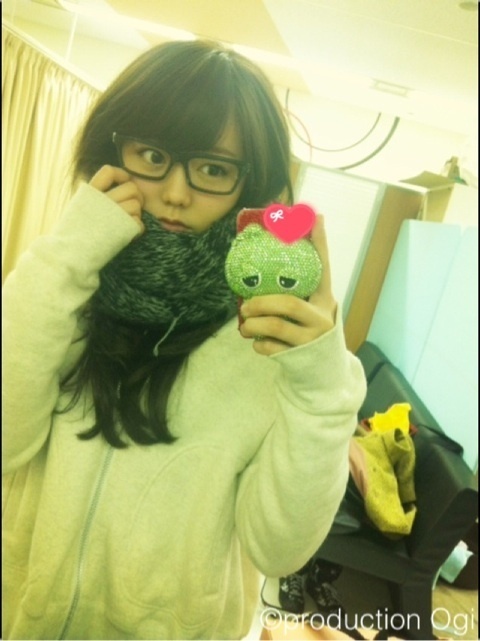 After that they still had some time, so other girls chatted and Airi opened an e-mail that she got a week ago. I heard the news from Reina, that you have lots of work piled up, and plus your studies and the new project. I just wanted to say, that I believe you can manage things right, and if you feel too burdened, you know you can always write to me or call me. Also, if you push yourself too hard, the results might disappoint you. Better take care of yourself and try to not overwork, nee? I heard from Maimi-san, that you had thoughts about graduation, because you feel like you can't fulfill Tsunku-san's wishes. Well, don't think like this. He gives you lots of work BECAUSE he thinks you're special. You just have to try to organize things in such a way, that you can have plenty of rest and eating between the work and studies. You have my fullest support, so just you know that no matter what decision you make, I'll root for you. And good luck with that new project. I think it's an interesting turn in all of your careers, don't you think? She read it a few times again – like she does everyday – and smiled. “Good, Airi-chan.” smiled Reina and made some joke about food. Airi started pulling her random jokes, too. They were having already lots of fun. “Girls, it’s time.” said the manager, who just came in. “Un.” they all nodded and ventured towards the stage, where S/mileage where performing. THANK YOU EVERYONE FOR COMMENTS!! update soon and goodluck on your exams!! “Hai, minna, hontou ni, arigatou gozaimasu! !” thanked the crowd Wada Ayaka, the leader of S/mileage. Other members also thanked the crowd, feeling the cheers warming their hearts. Then suddenly the crowd started screaming and cheering so loudly, they had to look around to see what happened. Their faces went into a pleasant shock, as the five girls appeared on the stage, waving their hands and saying ‘hellos’ to the crowd at their mics. “EH?” confused looked at them Fukuda Kanon. Others were too speechless to speak. “Hai, minna, otsukaresama deshita. The concert was awesome.” greeted them Reina, others also added their congratulating words. All S/mileage members bowed to their senpais, still not understanding what is happening. “Eto, Tanaka-senpai, I’m very thankful for all of you coming here and congratulating us, but...” Dawa tried to be all captaincy, though it was hard, as she was thinking about various reasons why senpais could be here. “You’re wondering why we’re here, right?” asked her and the crowd Maimi. The crowd cheered and the S/mileage girls nodded their heads. “Well, we have a surprise announcement, and we thought your concert is the best place to announce it.” said Miyabi. “Is it okay if we steal a spotlight a bit?” asked Saki. The girls nodded again, as they were curious not less than the fans, who were now cheering the names of those five. Then Maimi stepped up front. “I had the same shocked face as S/mileage members have now, when I found out the surprise that I was told by our manager. I hope this is as much entertaining as it was for me after it sunk into my head. C-ute’s leader Yajima Maimi desu. Yoroshiku onegaishimasu.” The crowd cheered her name and she thanked them. Then they all said at the same time the announcement and bowed at the astonished crowd. S/mileage members were happily dancing around, the words sounding in their heads. After the announcement on S/mileage's concert the five girls worked their asses off on promoting the newly formed unit. Not to mention they had loads of work on their equivalent groups and a lot of solo events and photoshoots. The girls were busier than ever but most of them managed to have a few days off. Except Airi. Reina skipped some of her practices as she knew her skills were perfect enough to let herself sleep longer. She trusted Sayumin enough to let her lead the girls - she was the captain after all - and even went shopping on some occasions. Of course, the solo events and photoshoots and handshakes was something the yankee girl never missed and attended them no matter how tired or sleepy she was. Though there was also another thing she never, not even once missed or skipped. REBIRTH practice. She had her reasons for that but no one knew about them. So the girl noticed how pale Airi has become, how more and more sleepy the C-ute's ace was and how, despite the loads of work she had, the kappa girl kept giving her all to fans and on studying and practicing. One day Reina was rolling lazily in bed after she decided to skip another practice of Morning Musume. Somehow, lately she felt like the group requires more and more energy from her which was not an OK thing for Reina. So she spent her morning in bed and soon her phone rang. A message came and the contents said that Airi fainted while in C-ute's practice and now was in the hospital. Reina didn't even think one second. All her laziness was gone as she hurriedly prepared - probably the first or second time in her life it took her only ten minutes to prepare - and dashed out. Her destination was hospital and she was already calling Maimi to get the address. Airi was dozing off in the hospital's bed, not happy with herself and angry at the whole world. She felt like she failed not only herself, but all the people who believed in her also. Her frustration with herself grew bigger after she got a lot of comforting and 'get well soon’ messages from various members. She didn't want to feel pity; she wanted to be a role model and an example on how to handle loads of works. She always felt like she can really do more than anyone else to compensate for all those times the dance teacher yelled at her or the times she fell sick and couldn't attend the events. With this happening to her she felt like the world crumbled around her and the leader status that Takahashi senpai entrusted her with...she felt unworthy. A gentle knock on the door made the girl open eyes and try sitting more properly despite the huge pain in her head. "D...douzo..." She said weakly yet tried to put on a cheery smile. However when she saw who her visitor was, Airi's eyes went wide. She expected anyone but Reina-san. The senpai was a person who distanced herself from other people and despite being in the same unit - twice - they never talked more than casual joking around with other members. Thus this really surprised her. "Eeh... Tanaka-san..."
"Airi-chan.." Reina approached the bed with a basket of fresh strawberries and looked at C-ute's member worriedly. "How are you feeling?" "Ah, I am fine... They should let me out soon." At least that was what Airi was hoping for. She didn't want to miss any of the lectures or lessons or any of the events. She had a lot of catching up to do. The girl felt like this one day that she is missing out costs her a lot more than others might think. "Here, I brought you some strawberries~" Reina put the basket on the table by the bed and sat on the chair that was close by. "You probably are surprised, thinking why Reina is here, right? The senpai who never lets anyone into her own personal space..."
"Ah, to be honest, I was really surprised...Gomennasai..." Suzuki lowered her head. "It's just that Tanaka-san seems distant all the time, and to come here visit someone not worth your attention... I am sorry for not being capable by myself and making everyone worry... I'll try harder..."
"Airi. What are you talking about? You are already working harder than anyone else. That is why we all worry. We want you to rest more. Take at least a few free days from studying, eat properly, say no to some of the works or ask Tsunku-san to give you a day off. I am sure he will gladly let you rest." Reina couldn't help but worry over how Airi had such a low esteem of herself. "...Maybe I'll ask for a day off..." Airi knew she could use the day off for studying so it was not a bad idea. After visiting Airi Reina didn't feel one bit better. She didn't like the way the girl was talking about herself. The doctor was nowhere to be found and the nurses didn't know more than what Reina knew herself so she couldn't ask about the girl's condition and suggestions on how to better her health. At these times there was only one person that Reina always turned to and this time was no exception. She met with Ai-chan in the cafe near the place where Takahashi was rehearsing for the musical. She was not surprised to see Risa-chan there, as she knew the two were secretly dating, despite what rumors media spread about these two dating guys. "We heard about Airi-chan. I was thinking of writing to her but... Knowing the girl...she must be quite down..." Ai started the topic after they all got some coffee and ice cream. "Yeah... This is why I came here to talk to you...." Reina retold the conversation she had with Airi when she was visiting her. "That's serious..." Risa sighed and looked at Ai. "You know her really well. Is there a solution to this?" "Mhm... I would usually message her, like... 'Go to sleep early, okay?' or 'Make sure to eat dinner.' and she would reply to me 'I will, Takahashi-senpai, thank you for all the care and sorry for making you worry'. After I talked with her in private that she doesn't have to apologize for those kinds of things she stopped apologizing but I could tell she was still down. I really don't know... She is so happy go lucky around everyone but when only with me or alone... I can tell she is burdened by a lot..."
"Tanakacchi, you must think of something. Talk with her fellow C-ute members, especially Maimi. I am sure there is a way to solve this. And we will go visit her and try to blow some life and self esteem into her, okay?" The bean girl suggested. "Un, I'll do my best... So guys, tell me about yourselves. Oh, ice cream~"
They ate and talked cheerily but Airi not even once left their minds. They all three wanted to help the girl, an important member who was like a family to them. Oh My Gosh... A mixing High-King and Aa! would be so epic. I can't wait till the next chapter. Well anyways Reina has more of a passionate side than people expect her to have and Airi feels that if reina had to become this character it means more than anything else to her. Page created in 0.506 seconds with 19 queries.